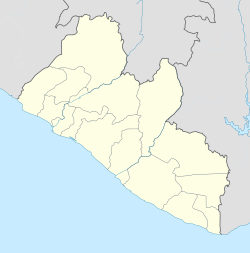 For other places with the same name, see Monrovia (disambiguation). Monrovia /mənˈroʊviə/ is the capital city of the West African country of Liberia. Located on the Atlantic Coast at Cape Mesurado, Monrovia had a population of 1,010,970 as of the 2008 census. 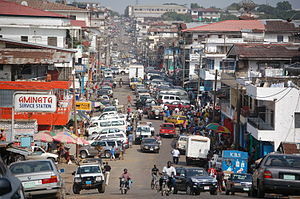 With 29% of the total population of Liberia, Monrovia is the country's most populous city. Founded on April 25, 1822, Monrovia was the second permanent Black American settlement in Africa after Freetown, Sierra Leone. Monrovia's economy is shaped primarily by its harbour and its role as the location of Liberia's government offices. Monrovia in the 19th century. Visiting US President Jimmy Carter and Liberian President William Tolbert wave from their motorcade, 1978. In 1816, with the aim of establishing a self-sufficient colony for emancipated American slaves, something that had already been accomplished in Freetown, the first settlers arrived in Africa from the United States, under the auspices of the American Colonization Society. They landed at Sherbro Island in present-day Sierra Leone. Many settlers died in the landing. On January 7, 1822, a second ship rescued the settlers and took them to Cape Mesurado, establishing the settlement of Christopolis. In 1824, the city was renamed Monrovia after James Monroe, then President of the United States, who was a prominent supporter of the colony in sending freed Black slaves and ex-Caribbean slaves from the United States of America and Caribbean islands to Liberia and who saw it as preferable to emancipation in America. At the beginning of the 20th century, Monrovia was divided into two parts: (1) Monrovia proper, where the city's Americo-Liberian population resided and was reminiscent of the Southern United States in architecture; and (2) Krutown, which was mainly inhabited by ethnic Krus but also Bassas, Grebos and other ethnicities. Of the 4,000 residents, 2,500 were Americo-Liberian. By 1926, ethnic groups from Liberia's interior began migrating to Monrovia in search of jobs. The population of Monrovia reached 10,000 by 1937; at that time, Monrovia's police department had 30 members. In 1979, the Organisation of African Unity held their conference in the Monrovia area, with then president William Tolbert as chairman. During his term, Tolbert improved public housing in Monrovia and decreased by 50% the tuition fees at the University of Liberia. A military coup led by Samuel Doe ousted the Tolbert government in 1980, with many members being executed. Monrovia lies along the Cape Mesurado peninsula, between the Atlantic Ocean and the Mesurado River, whose mouth forms a large natural harbor. 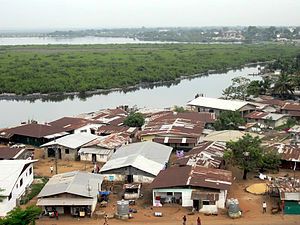 The Saint Paul River lies directly north of the city and forms the northern boundary of Bushrod Island, which is reached by crossing the "New Bridge" from downtown Monrovia. Monrovia is located in Montserrado County and is Liberia's largest city and its administrative, commercial and financial center. A map of central Monrovia in 1996. A street in downtown Monrovia, 2009. Materials are also manufactured on-site, such as cement, refined petroleum, food products, brick and tile, furniture, and chemicals. Located on Bushrod Island between the mouths of the Mesurado and Saint Paul rivers, the harbor also has facilities for storing and repairing vessels. Monrovia is situated in the district of Greater Monrovia in Montserrado County. Administratively, instead of being divided into clans like other districts of Liberia, Greater Monrovia is divided into 16 "zones". Like clans, these zones are subdivided into 161 "communities". Greater Monrovia does not have an organized district administration like other districts, with all lower-level local authorities being directly supervised by the Montserrado County Superintendent. Municipally, Greater Monrovia District is subdivided into two city corporations and ten other local authorities (nine townships and one borough). Established by law in 1973 and operational since 1976, the Monrovia City Corporation (MCC) is responsible for the city's administration. The MCC also provides services to the townships and borough through a revenue-sharing arrangement, but has no zoning or enforcement jurisdiction in them. Radio and TV stations are available, with radio being a more prominent source of news as problems with the electric grid make watching television more difficult. UNMIL Radio has been broadcasting since October 1, 2003. It is the first radio station in Liberia to broadcast 24 hours a day, and reaches an estimated ​2⁄3 of the population. The state-owned Liberia Broadcasting System broadcasts nationwide from its headquarters in Monrovia. STAR radio broadcasts at 104 FM. Dwellings along the Mesurado River in Monrovia. Discarded plastics can be seen washed up on the bank opposite the buildings. ^ "Global Statistics". GeoHive. 2009-07-01. Retrieved 2010-07-04. ^ "Map of Liberia, West Africa". World Digital Library. 1830. Retrieved 2013-06-02. ^ a b Tiyambe Zeleza, Dickson Eyoh et al., Encyclopedia of Twentieth-Century African History. Books.google.com. Retrieved 2010-07-04. ^ "The terrifying mathematics of Ebola". Channel 4. 2014-09-11. Retrieved 2014-09-11. ^ a b "Liberia Housing Profile" (PDF). United Nations Human Settlements Programme. 2014. pp. 14–15, 23. Archived from the original (PDF) on 2017-10-17. Retrieved 2017-10-16. ^ "Climate: Monrovia - Climate graph, Temperature graph, Climate table". Climate-Data.org. Retrieved 2014-01-05. ^ "Klimatafel von Robertsfield (Int. Flugh.) / Liberia" (PDF). Federal Ministry of Transport and Digital Infrastructure. Retrieved 15 June 2016. ^ "STATIONSNUMMER 65660" (PDF). Danish Meteorological Institute. Ministry of Energy, Utilities and Climate. Archived from the original (PDF) on January 16, 2013. Retrieved 15 June 2016. ^ a b Timberg, Craig (March 12, 2008). "Liberia's Streets, Spirits Brighten; Four Years After War's End, Battered W. African Nation Begins a Slow Reawakening". The Washington Post. pp. A8. ^ "Montserrado County Development Agenda" (PDF). Republic of Liberia. 2008. pp. 4, 29. Retrieved 2017-10-16. 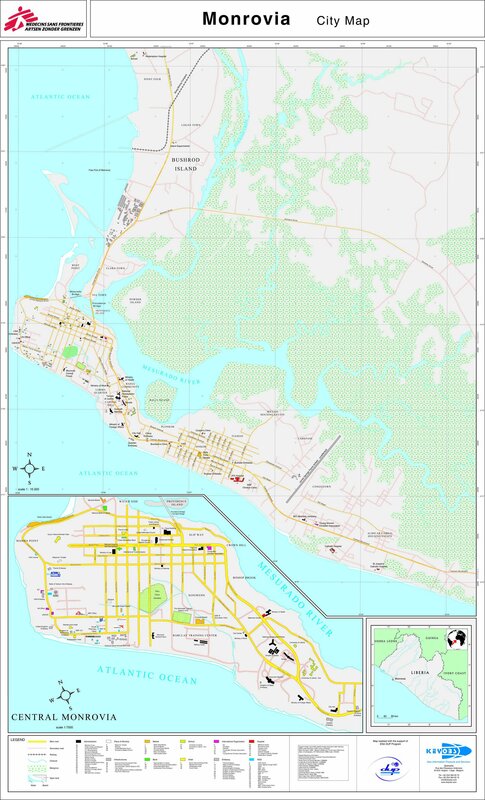 ^ "Greater Monrovia, Liberia - Administrative Boundaries Overview" (PDF). ReliefWeb. Liberia Institute of Statistics & Geo-Information Services. Retrieved 18 August 2017. ^ a b "THE TRANSFORMATIVE ROLE OF CITY-COMMUNITY PARTNERSHIPS IN THE FIGHT AGAINST EBOLA AND BEY OND IN GREATER MONRO VIA, LIBERIA" (PDF). Cities Alliances. Retrieved 2 January 2018. ^ "THE LIBERIA COUNTRY PROGRAMME" (PDF). Cities Alliance. Retrieved 2 January 2018. ^ "A BRIEF HISTORY OF THE CITY OF MONROVIA - By: Madam Ophelia Hoff Saytumah City Mayor of Monrovia". Monrovia City Corporation. 2007-09-29. Retrieved 2017-10-16. ^ "ORDINANCE NO. 4". TLC Africa. Retrieved 2017-10-16. ^ "The First Greater Monrovia City Forum" (PDF). Cities Alliance. 2017. p. 3. Retrieved 2018-01-31. ^ "Trustees of Donations for Education in Liberia Records: 1842-1939". Massachusetts Historical Society. Retrieved 3 February 2010. ^ Burrowes, Carl Patrick (2004). Power and Press Freedom in Liberia, 1830-1970. Africa World. p. 117. ISBN 1-59221-294-8. ^ Payne, Daniel Alexander (1922). A history of the African Methodist Episcopal church: being a volume supplemental to A history of the African Methodist Episcopal church. Book Concern of the A.M.E. Church. p. 181. ^ "African Series Introduction: Volume VIII: October 1913--June 1921". The Marcus Garvey and UNIA Papers Project. UCLA. Retrieved 3 February 2010. ^ "Nathan Ross; Was Mayor Of Monrovia". The Washington Post. January 28, 2003. ^ Thompson, Era Bell (January 1972). "Liberian Lady Wears Three Hats". Ebony. pp. 54–62. ^ About us. Archived 2008-09-10 at the Wayback Machine STAR radio. Retrieved on October 13, 2008. ^ Home page. American International School of Monrovia. Retrieved on April 7, 2015. "Old Road, Congo Town, Monrovia, Liberia, Africa | P.O. Box 1625"
^ a b "LIBERIA: Disease rife as more people squeeze into fewer toilets", IRIN News, 19 November 2009. ^ "LIBERIA: No relief as most Monrovians go without toilets", IRIN News, 19 November 2008. Wikimedia Commons has media related to Monrovia. Wikivoyage has a travel guide for Monrovia. "Monrovia" . New International Encyclopedia. 1905. "Monrovia, Liberia" . Encyclopedia Americana. 1920. "Monrovia" . Collier's New Encyclopedia. 1921.